Offering dedicated legal services, our team at M&Y Personal Injury Lawyers aids people and families in Los Angeles, California, and throughout Los Angeles County. For the convenience of our clients, our law firm also has office locations in Fresno, San Jose, San Diego, Van Nuys, Long Beach, Anaheim, Riverside and San Bernardino. Without warning, the negligent or careless actions of others can leave people struggling with serious injuries. In addition to their physical and emotional pain and suffering, they may have concerns over lost wages, meeting their financial obligations and mounting medical bills. We are passionate about helping those injured through no fault of their own to achieve financial justice. Since our law firm's founding, we have committed ourselves to help those injured as a result of motor vehicle accidents, trucking accidents, dangerous property conditions, animal bites and other such incidents to recover the maximum compensation. We also aid clients with wrongful death claims. Our attorneys have seen firsthand the effects of burn injuries and brain injuries, and we assist those we represent to obtain the additional aid they need such as medical treatment. 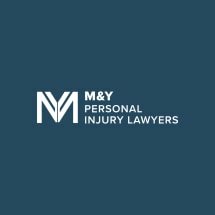 Our law firm team at M&Y Personal Injury Lawyers knows that while cases may share similarities, each legal situation is different. Beginning with a free initial consultation, we review the details of our clients' cases with them and take the time to understand how their lives have been affected by their injuries. Our attorneys offer customized guidance, and we tailor our approach based on each client's specific needs and goals. We work closely with those we represent and keep them informed of their rights and options at each stage of the legal process.